Recently I have been using several varieties of Annie's salad dressings, which I really like (and will post about later this week). 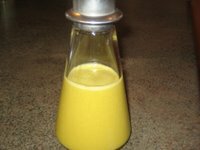 Last night, though, I really wanted my own homemade vinaigrette, because I have yet to find a bottled dressing that stands up to the fresh taste and 'unheavy' texture of one that's freshly made. 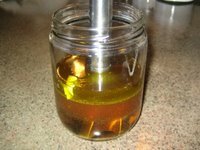 So, I made my Sweet Maple-Hemp Vinaigrette from Vive. Vinaigrettes are simpler than most people think. I find it's easiest to use my - yes, you guessed it - immersion blender . That's because it: helps emulsify the ingredients, does so quickly, and is easy to clean. 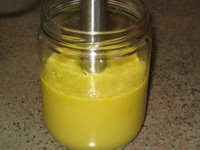 Below is the vinaigrette with the immersion blender before whizzing (I use cleaned jars from nut butters), and then after (on right). 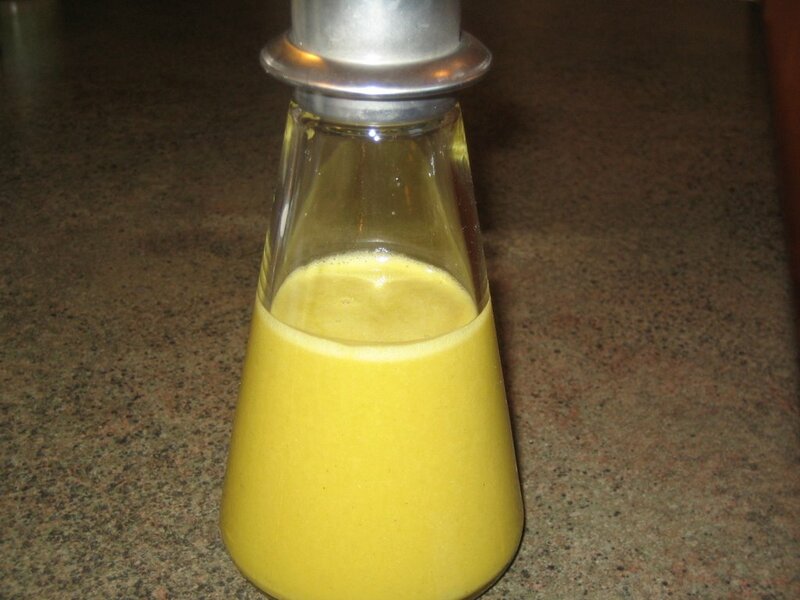 Then, I used a funnel to transfer my dressing to the bottle pictured on top. 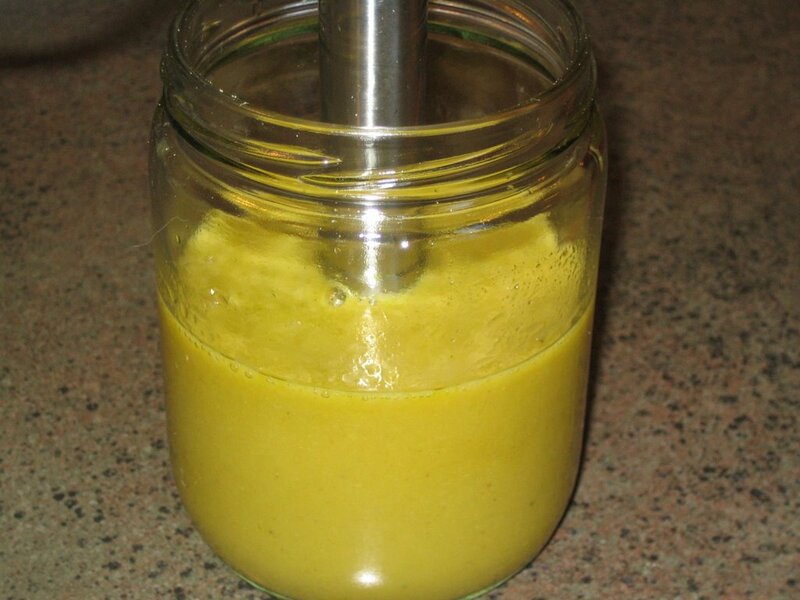 I love this maple-hemp vinaigrette because first, it uses hemp oil, which is very healthful containing a ratio of essential fatty acids that is almost perfect for what our bodies need. I posted about hemp foods before, and Vive includes a section on these foods. You can also visit Manitoba Harvest for more information. Manitoba Harvest is the brand I use, and used for testing my recipes for Vive. Secondly, I love this dressing because other than the hemp oil, the ingredients are stuff we have on hand and so that makes it super-fast and simple! Finally, I love the combination of the maple syrup and the hemp oil. Through my testing, there are a few ingredients that I found really paired well with hemp... maple syrup is one, and this dressing highlights your salad with a slighlty sweet, sunflower flavor that goes well with many entrees! I've never done anything with hemp in recipes and I don't think I ever will but I find all of your recipes fascinating. I like the necklaces and hats, though. Yum. This gives me a good excuse to buy more greens and get an immersion blender. Thanks for the photo, it really helps us all with your AWESOME BOOKS get an idea of looks (which I'm picky about). I've never tried hemp oil, what else do you like it with? Oh, and I currently have Every Day Vegan out from the library again, I most something last night ; ) It wasn't a full meal, but after trying it with dinner last night, I was really looking forward to lunch today : ) I'll post pictures later. Thank you! Thanks, Nancy... it's so true, we have our 'reliables', and as convenient as they are, we do lose out on variety and exploring different flavors. I love playing with vinaigrettes to jazz up an otherwise predictable meal! Ms. Mercedes... yeah, absolutely I use the hemp seed nut, nut butter, and oil from time to time. I included about a dozen recipes with hemp foods in Vive, just because I figured that there was a segment of the vegan/vegetarian population out there that probably wanted to know how to cook with these foods but not sure where to start. I use the oil in salad dressings primarily, and then the seeds and seed butter mostly (but not entirely) in baked goods and desserts (believe it or not)! I haven't experimented with the hemp flour, though. Hi Jess (I still have my neck contorted trying to figure out your new avatar! You're so much fun switching them up all the time.) 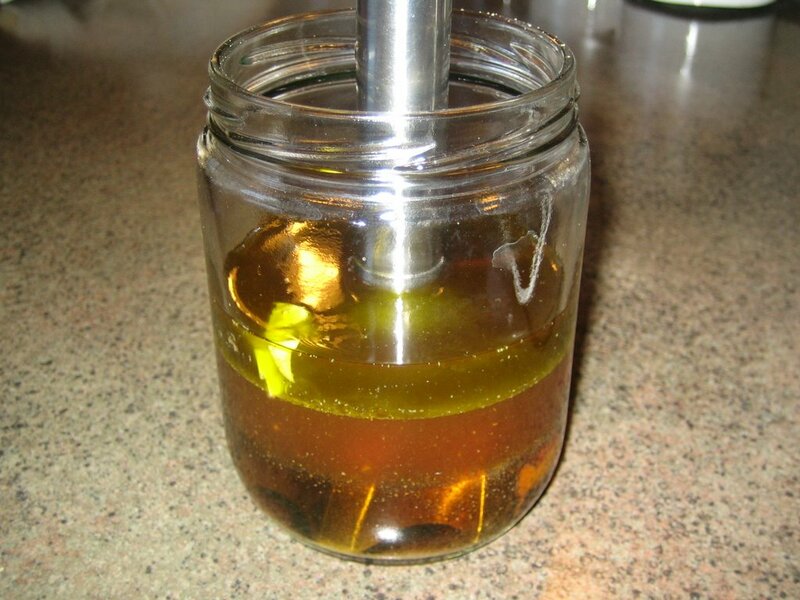 Anyhow, I mostly use hemp oil in salad dressings, because like flax oil it loses much of its healthful properties when heated. So, you can think of using it much like you now use flax oil, but it having a sunflower-type taste. I will be checking out your blog soon... (still trying to recover from those cakes)! What kinds of veggies and salad ingredients do you suggest for eating with this delicious salad dressing? Thanks! Yes, Preston, yellow!... the color of sunshine from which all the good things on our earth grow! (don't I sound hippity dippity... even though the dressing isn't *quite* as yellow as the photo is showing). Hi Harmonia! Well, I'm glad it didn't get too rough with your storm... but snow, ugh, esp this time of year! I really need to get back into eating salads w/ my meals. I have tried your Simple Cider Dressing & it was good. This one sounds good and is pretty too!